The Plateau Breaking Diet: Crack the Fat-Loss Code: Outsmart Your Metabolism and Conquer the Diet Plateau is written by Wendy Chant, a certified personal trainer, competitive bodybuilder and sports nutrition specialist. Chant claims that with her plan you can lose 25 pounds in eight weeks by gaining control of your appetite, boosting your metabolism and breaking the diet plateau forever. Chant says that the human body has evolved to resist starvation by holding on to fat and this program is scientifically designed to help you trick your body into storing and burning more calories. Crack The Fat Loss Code begins with a low carbohydrate diet, which is followed for the first seven days. The purpose of this is to deplete the body’s stores of glycogen, which increases fat burning. During weeks two to four you alternate days of high, medium and low carbohydrates. Alternating your carbohydrate and calorie intake enables you to lose weight while preventing your body from going into starvation mode. Weeks five and six are the accelerated fat loss cycle and weeks seven and eight are the maintenance cycle. In each cycle you will consume 4-6 small meals a day that always contain protein. Cheat days are also built into this plateau breaking diet so that you never have to go completely without your favorite foods. Once you have been through a few cycles no foods are entirely off limits. Oatmeal, brown rice, cottage cheese, protein shakes, chicken breast, turkey breast, salmon, eggs, broccoli, asparagus, lettuce, tomato, olive oil, light mayonnaise, mustard, low-sugar jam. Exercise is necessary in Crack The Fat Loss Code to allow you to burn calories and produce heat in your body. Chant advises dieters to perform both cardiovascular exercise and weight training after the first week however the book does not include a specific exercise plan. 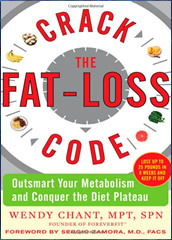 Crack the Fat-Loss Code: Outsmart Your Metabolism and Conquer the Diet Plateau retails at $16.95. Alternating high and low carbohydrate days can boost metabolism. May help to break through a weight loss plateau. Includes inspirational stories and photos of successful dieters. Cheat days help make it easier to stick with the program over the long term. May be difficult to follow as a long-term plan. Requires dieters to limit their intake of healthy carbohydrate foods including fruit, root vegetables and whole grains. Meal plans do not include many vegetarian options. Dieters may experience fatigue on the days when carbohydrates are restricted. Does not provide adequate exercise guidelines. Does not adequately address the psychological factors involved in successful dieting. Crack the Fat Loss Code looks at how we can manipulate our bodies to burn fat more effectively by adjusting our dietary patterns. This program may be of particular benefit to long-term dieters who have hit a plateau with their weight loss. It will appeal to dieters who prefer to follow a structured meal plan and enjoy learning about the science of dieting.